So the goal for the holidays, really, was to make stollen from scratch. I made stollen once before, but it was from a Mary Berry mix. Everything was prepped for me so all I had to do was mix everything up. I was determined to find a recipe I could follow that was as close to Mary Berry’s as possible. I searched for a stollen recipe but suprisingly couldn’t find one in my numerous books (to be completely honest, I didn’t really look very far! Ha!). But as luck would have it, Edd Kimber’s book Say It With Cake has a wonderful recipe for stollen. I added a little tidbit: I soaked the dried fruits in brandy overnight. Makes for an interesting taste. It called for nuts in the recipe, but I didn’t have any to put in so I did without that. And because I like my marzipan spread through out the bread instead of in a big lump in the middle, I rolled my marzipan flat so that it would be distributed throughout the loaf. I was quite surprised at the size of the stollen though. It came out bigger than I thought! But it did look so pretty when it was dusted with icing sugar! I was quite pleased with how it’s turned out. The stollen came out beautifully! Am now not too afraid to make breads, aided of course by my Kenwood chef (obviously not paid advertisement, although, I would love it if Kenwood took notice and gave me free stuff! Ha!). I wanted to learn how to make stollen mostly because of my dad. He talks about the time when his entire family lived in Vienna and stollen eventually filters into the conversation. It has always been a dream to bake something that reminded my father of happy times with his parents and siblings. A few more practice sessions so that I can develop my own take on stollen! But until then, Edd Kimber’s recipe with my own tweaks to it will do me just fine! I love Twitter because it makes celebrities more accessible. Now, before you think that that statement sounds lightly stalkerish, I don’t mean you follow their every tweet. It just allows you to post a comment and it allows the people you look up to to respond to your message. I’ve had a few fan girl moments on Twitter where my baking heroes have actually responded to my tweets. It can be quite the giddy moment. I have quite a few favourites on Twitter from the Great British Bake Off. One of them being the first ever winner Edd Kimber. I’m not ashamed to say that I very much wanted Ruth Clemens to win that series but it was, really, an undeniable truth, that Edd was quite the baking talent. I became quite the Edd Kimber fan when I was given his cookbook. 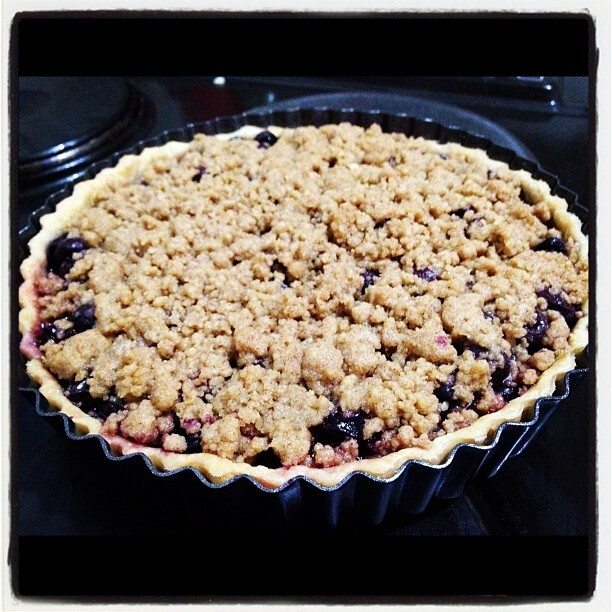 His blueberry streusel pie is absolutely amazing and the streusel recipe is so versatile! I’ve used it for other baking projects and it has been a wonderful addition to my other fruit pies! 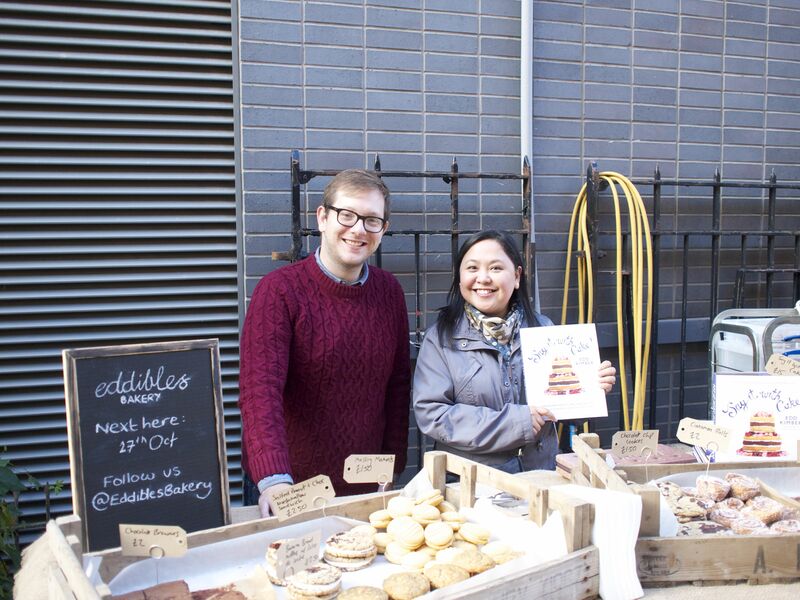 Edd has a stall in Maltby Street Market selling his lovely baked treats from his Eddibles Bakery. I’ve been twice now. And today, I had the chance to get his new book (which is on my cookbook wishlist) and get it signed too! 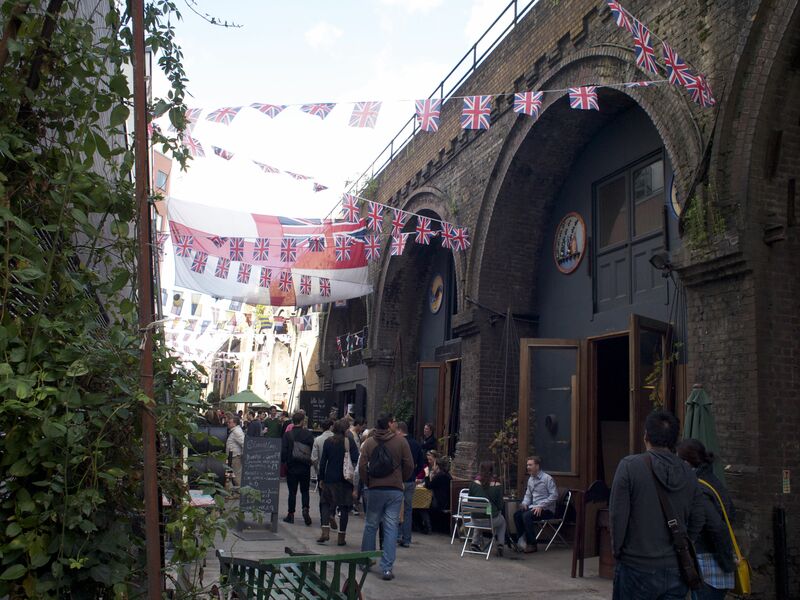 Edd was lovely and very accommodating. He talks to the people who visit his stall and talk to him about the GBBO and his baking and his books. I felt really cheeky asking him to sign the book for me but he did, even saying that he brought a pen for “just in case!”. I asked if he could take a photo with me and he said yes! Total fan girl moment. I was honestly feeling a bit under the weather this morning but this certainly lifted my spirits! I think I chose the perfect recipe from Edd Kimber’s book. The book was a gift from Alan (who enables my cookbook addiction!). I am diabetic which means that I can’t have as much sugar as the next person, so I figured trying a fruit recipe would be the safest bet. I reduced the amount of sugar by about 50 grams and I was quite fortunate that the blueberries that I bought had a good sweetness and tart ratio! Also, the crumble topping allowed me to use my pastry mixer (which I called a pastry cutter for ages, but I was told it was called a pastry mixer in bonny old England! yes, me and my Americanisms, eh?)! 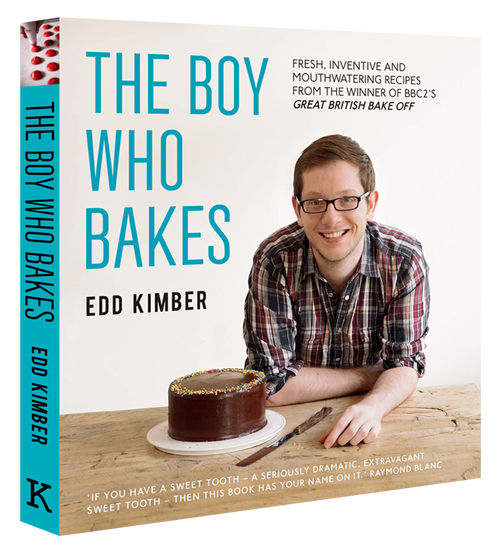 Edd Kimber was the first ever winner of the Great British Bake Off. Mind you I was rooting for Ruth Clemens but it was a completely undeniable truth that Edd had the gift! The book is lovely and the pictures are gorgeous! They seem scream out to you, “Bake me! 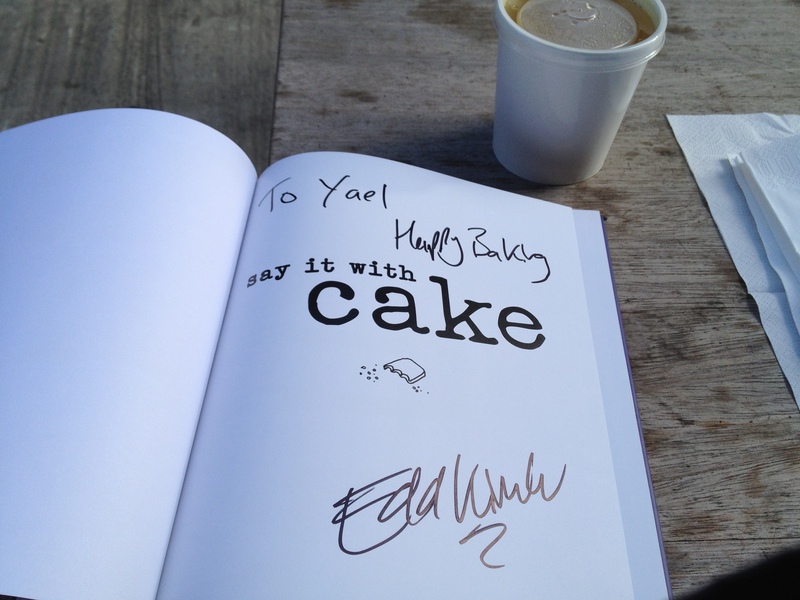 Bake me!” Plus Edd’s hands looked really gentle and elegant…soooo different from my chipolata sausage fingers! But I digress. This is really about this lovely book! The instructions are clear and concise and very easy to follow. I love the way everything was described systematically: what you had to do, when you had to do it, how long you had to do it for. I also love the layout of the book and how everything looks pristine and clean. What I love the most is how my pie, seeing that it was the first time I’d made the pie and seeing how I’d tweaked the recipe, looked almost identical to the photo in the book. I was beaming with pride! Edd Kimber was happy enough to retweet the photo of the pie I posted on Twitter (yes, it was a fan girl moment, bless my giddy heart!). You MUST try Edd’s recipes. I’ve got a challenge set up for myself to try the macaron recipes next. But if you want a wonderful fruit pie recipe that’s easy to make and comes out beautifully, this book should become one of your regulars in your recipe arsenal! It is absolutely YUM!